I’ve been thinking about my job (as a mother) a fair bit recently. After Monday’s blog post, I felt that I might have given the wrong impression of what life around here looks like. I have a policy (with myself) not to complain or whine on this blog — not about big city life and not about my family. I aim to share fun things we get up to but I don’t tell you about the days we’re all grumpy with cabin fever and scratchy with each other. I share the milestones the kids have reached, instead of focussing on their failings. I do this not to give some sort of impression that we’re some perfect happy family but because I think if you focus on the good things, you’ll feel better about life too. Sort of an excercise in contentment. But guess what, I’ll let you in on a little secret in honour of Mothers’ Day. One that you probably knew already. Mothers make plenty of mistakes. I’m one of them. There are days when I am selfish, that I don’t discipline when I should, when I get annoyed without good reason. I have to apologise to my kids on an almost daily basis because I snap, or yell, or speak harshly. If you’re a mother, I’m sure you can identify. When you don’t have kids, it’s so easy to look at other mothers (including your own) and say “Oh, I’ll never do that.” Until you become one yourself. It’s so easy to feel superior when you’re not knee-deep in mothering yourself. And sometimes we forget that we’re knee-deep and look over to the mother who slipped up and now has mud on her nose. Then we feel oh-so much better about ourselves. You know why motherhood can be so hard? Because when you become a mother, your role as servant begins in earnest, whether you want it to or not. Sure, we are all called to serve one another, but you can quickly tick that off the list with a ‘Yes, I helped the old lady across the street’ type of servant attitude. When you’re a mother, you simply have to serve, and the only time that becomes an issue is when we don’t want to. With the same tone of voice as a 3-year-old. It grates on us, because there are sacrifices aplenty. I was sitting in the laudromat thinking again last night that it really boils down to me breaking the summary of the law: loving myself more than God (not submitting to his will for my life), and loving myself more than my neighbour (my kids). Being a mother is not glamorous! There is no pay-rise, no promotion. Being a servant grates only because I don’t remember that Jesus iss The Ultimate Servant who calls me to imitate Him and serve others. Yes, I am called to serve the wider world, but more importantly my husband and children, because that is where he’s blessed me to be. Or have you read some of those scriptures, and considered how well your mother served you? Now that I’m a mother myself I realise more and more that there is no such thing as a perfect mother, because mothers are sinners. And yet, in God’s grace, he gives us good mothers. I think back on some of the things I thought were harsh when I was a kid, and now I realise were totally not! I look back and see my mother’s hard work, her discipline and her support (among many other good things) bear fruit in my life, and through that even in my children’s lives. Thank you, Mamma, I love you. Thank you for serving me and my siblings so well, and so faithfully. As mothers, our rewards might be small, but precious (hugs, kisses, a “look, mum, look!”, smiles, good behaviour, etc). Nestled in a chapter about good and bad servants we are reminded “Truly I tell you, whatever you did for one of the least of these brothers and sisters of mine, you did for me.” (Matt 25:40) Servanthood only grates when I forget that my reward is with Him in eternity, and not with my kids’ behaviour or accomplishments or (lack of) affection. I am a sinner and I fail daily, but through God’s grace, I can be a good mother. This Mothers’ Day, take time to remember the faithful servant God gave you who you called your mother. And if you’re a mother, let’s not … please ourselves. Let each of us please [our children]… to build them up. This is a really great devotional! Excellent! I can’t say enough about it. I’m proud to have you as a daughter. Hopefully your Mum doesn’t mind sharing you with us. Thanks, Dad! I have the privilege of not only having a great mum, but also great parents-in-law! 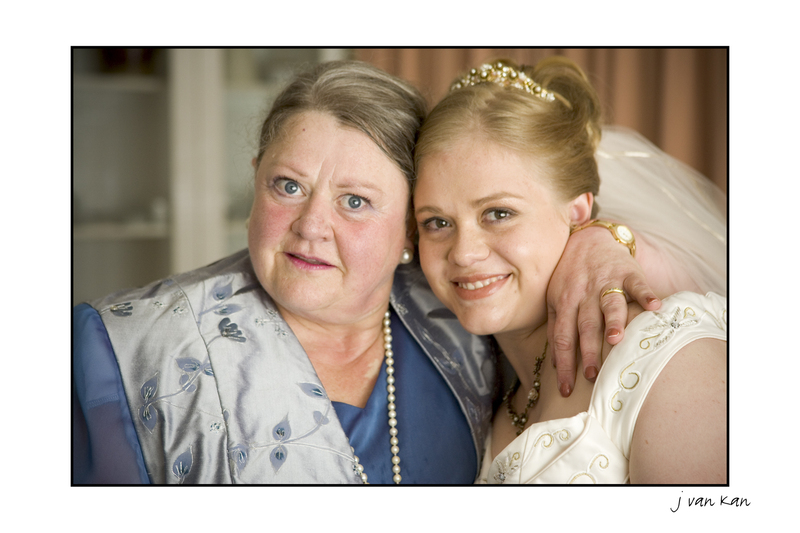 It is wonderful to see that photo again of you and your mother – both of you looking wonderful – from your wedding. I say ‘again’ because I’m sure I saw it before when I’ve looked through all your wedding photos! But sometimes one photo by itself stands out as more special. Loved this post. Can really relate too (as I am sure many other mother’s can). One of the things I love about being a mother is the new appreciation you have for your own mother. The other night when I was rinsing throw up of Eva’s sheets, pjs, doll, etc. at 1am in the morning I had to stop and think “I’m sure my mother did this for me at some stage. Lord thank you that I have such a lovely mother”. Might I also say that although our ultimate example is Christ, He blesses us with great examples in our lives too and you, Franci, are a mother I aspire to be like. P.S. the photo of you and your mum is very beautiful. Thanks, Miriam. Yes, you’re right — motherhood makes us appreciate our own mothers more. I wish I knew all this when I was a kid — maybe I wouldn’t have wanted to grow up so fast then! Thank you for your blog. I don’t comment often but I am a faithful follower. I see now that your policy (with yourself) is one of the main reasons I enjoy coming back and reading. Thank you for giving me a peek into your lives. Thanks, Franci! I need to think more about this topic, and the one your link led me to … “Contentment”. I don’t think I’d read that one before. You’re very right – being a mother forces you to face these things in earnest! Yep, no hiding in this job! :-) Thanks for the encouragement — you happen to be one of the mothers whose example I like to follow, especially the calm way you in which you talk to your children. By the way, have you read “The Mission of Motherhood” by Sally Clarkson? I REALLY recommend it. Right along the sorts of lines you are writing. Thanks for the recommendation, Liana! I’m currently reading “Don’t make me count to three” by Ginger Plowman, which is also very good. Sort of halfway in between “Loving the Little Years” and “Shepherding a Child’s Heart.